After completing her honors thesis in 2011 titled “The Voices of the Lost: How the Poetry and Prose of the Great War Reveal the Mentality of the Lost Generation,” Danielle Blalock (history and Spanish) switched gears and focused her studies on Latin America while completing her Ph.D. in history at the University of Arizona. With the aid of a Fulbright grant, Blalock has the opportunity to travel to Chile to finish her research. She will live in the country for nine months, conducting research for her dissertation, tentatively titled “Collaborative Activisms: Chilean University Student Networks and Mobilization, 1964-1990.” Her research aims to contribute to the historical understanding of universities as political spaces. 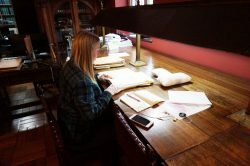 Danielle Blalock at work in the archives. While in Chile, she will also work closely with Professor Oscar Aguilera of the Universidad de Chile as an affiliated researcher on a Chilean Science and Technology Development Fund (FONDECYT) funded project, “The Visual Construction of Youth in Chile: Canon Representation, Intermediality, and Sensorium from Visual Images in Newspaper and Photographic Archives (1910-1973).” Her role in the project will include cataloguing and digitizing archival materials. To keep up with her travels, you can visit her blog at this link: https://chileanista.com.